Forget any puns or other connotations, London Glassblowing Gallery’s spring exhibition 2018 is the real deal! We will be showing a number of the UK’s foremost glassblowers, who, as part of their process also employ cold working techniques in resolving their work. As a glassmaker, one of the things I love most about this extraordinary medium is that molten glass demands instant decisions. Each nuanced change of shape or surface influences the final form of a piece. This work examines the metameric phenomenon; when two individual colours appear indistinguishable to the human eye, their difference revealed with a change in ambient light. Glass reflects light but also allows light to pass through and project. The nature of this dynamic and how it affects light of different wavelengths reaching the eye lends itself to the this phenomenon. When researching colour in glass for this body of work I noticed that when I combined nuanced hues with base colours, especially greys, and darker colours, they would not be immediately apparent. Only gradually as the eye adjusts and compares, is their realness revealed. In displaying this work, I place selected colours together and stack them to created a cross-link between each nuanced hue, bringing forth a subtle symphony of interactions and realisations to be discovered and contemplated. 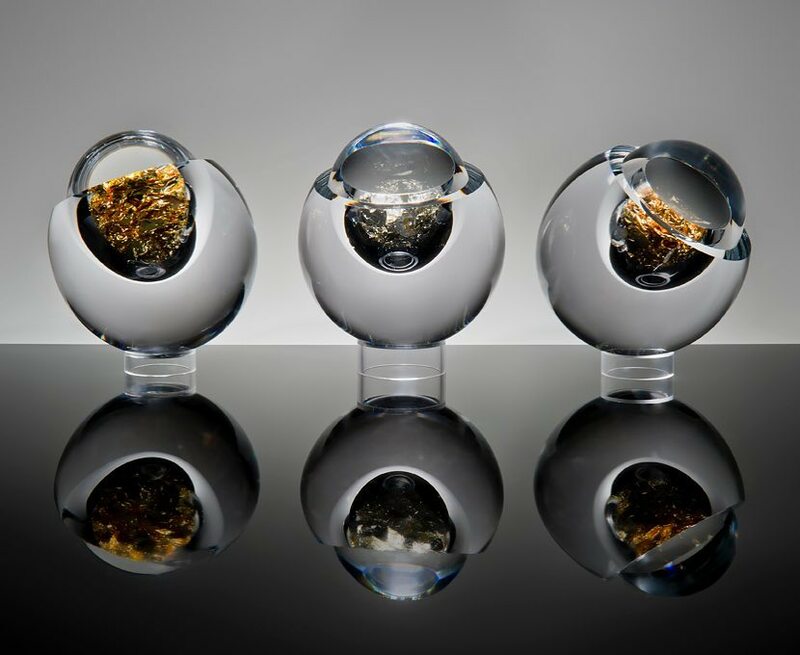 The series of work that Simon is exhibiting has been produced using the ancient technique of murrine, developed in the Middle East over four thousand years ago and revived by the Venetians in the sixteenth century. 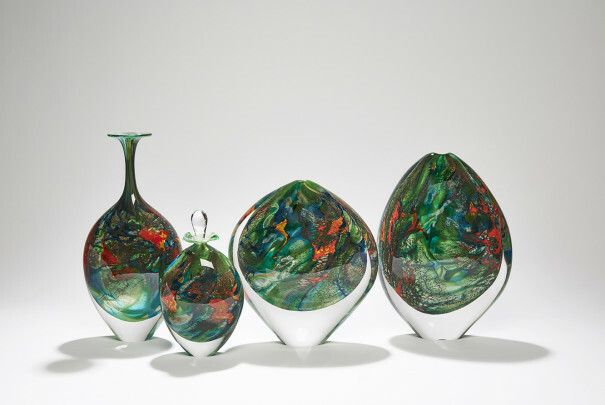 The process involves a time-consuming method of cold working coloured glass components that are then taken to the hot shop to be encased in further layers of coloured glass, and when molten, stretched into canes. When these canes are cut into slices the cross section reveals the image that was previously cold worked. Sometimes these canes are bundled together and the stretching process is repeated to form complex murrini. These are then sliced up, arranged on a kiln shelf and heated at the furnace then manipulated to form a single object. Once annealed the surface of the object is cut and smoothed on diamond wheels. Simon has made glass for studios in the Shetland Islands and Malta, been Teaching Assistant to many internationally renowned studio glass artists including participation at Pilchuck Glass school in the USA, during the International Festival of Glass in Stourbridge, which he has been involved with since its inception in 2004, and has been a Glass Technician at the University of Sunderland. Simon is a Glassmaker and Artist who has been working with Glass for twenty-eight years, starting his apprenticeship at Isle of Wight Studio Glass in 1990. He has taught at the University of Wolverhampton School of Art since 1998 where he is the Demonstrator in Glass and lives in rural Shropshire with his wife Rebecca, a dog and a cat. Organic forms are a recurring theme in my work. My new series ‘Repose’ originates from forms found in nature’s library and is an exploration between the interplay of translucency and opacity. 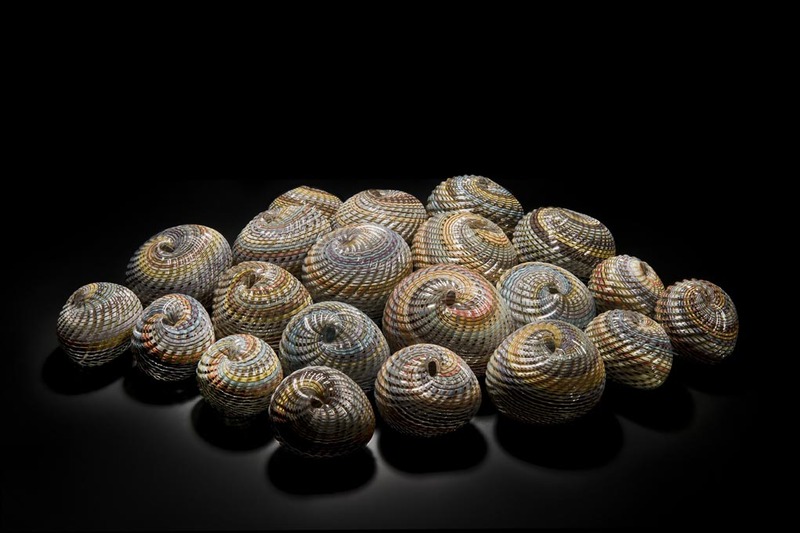 This work seeks out the subtle and delicate colour variations often found in the interiors of shells and flora. The edges of the blown forms have been cold-worked into soft curves, enveloping hidden marvels, while the gentle undulating shapes are disrupted by soft indents made upon the surface, revealed by the concave shape. My work is inspired by our very own life cycle. The continuous cutting, which has no beginning and no end, reflects our own life pattern, whereby our essence is inherited and passed on through generations. Our own genetic traits, which can be recognised generations apart, are likewise reflected in my sculptures. ‘Portrait of the North York Moors’. Our work concerns itself with the Landscape, blurring the boundaries between abstraction and literal interpretation of the world around us. Our exploration and ‘Portrait’ of the landscape, in which we live and work, use’s a perspective that has only recently become available, digital satellite technology. This enables a new view of the landscape, revealing the geology, marks made by the harsh northern elements and layers of human endeavour, carved into the land, overlaid and overgrown, but clearly visible. Light illuminates the landscape around us and light animates our glass. We explore the play of light within each piece through the use of Swedish overlay. We slowly and meticulously carve into the fine coloured layers and surfaces of our vessel forms. Our subtly deliberately distorted bowl forms, represent the hollows of the dales and moor tops, the gentle distortion of each vessel creates a unique form. Each bowl is blown by Stephen Gillies and engraved by Kate Jones. How can we draw attention to the worst crisis in human history – that of global warming and pollution? Over the years, as a constant thread, ecological concerns have loomed large in Peter Layton’s work. In the late 60’s he exhibited a group of large multimedia installations entitled ‘Please keep off the Grass’, and he has continued to be preoccupied with these pressing issues. Could small stunningly beautiful and evocative objects, in this case cloudforms or icy pyramids, serve to remind viewers of the risks we all take with humanity’s future? Peter ponders whether they have the power to convey a deeper message, or whether he is attempting to invest these pieces with a significance they don’t deserve. You, the viewer, will decide! I create unique pieces of hand-blown contemporary glass. My approach balances the simplicity of the forms with a more complicated use of line and pattern. Nearly everything I make is cold worked and polished in some way, adding textures or revealing details within the glass. The initial draw to the material was the way the light passes through the material, and the vibrancy of the colours. 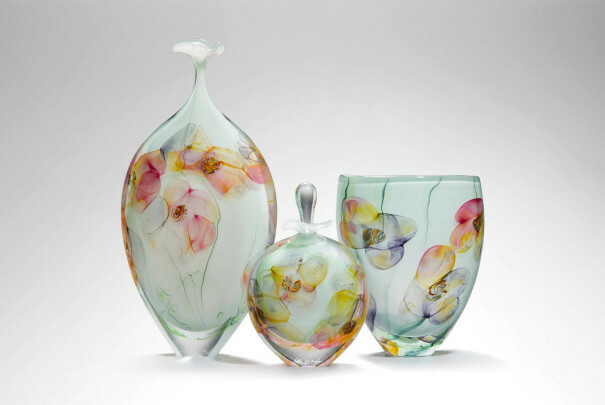 More and more I am drawn to the movement and fluidity of glass, capturing a given moment during the making processes. The cold working adds to the finished pieces by adding reflections and refractions to the thick polished surfaces. 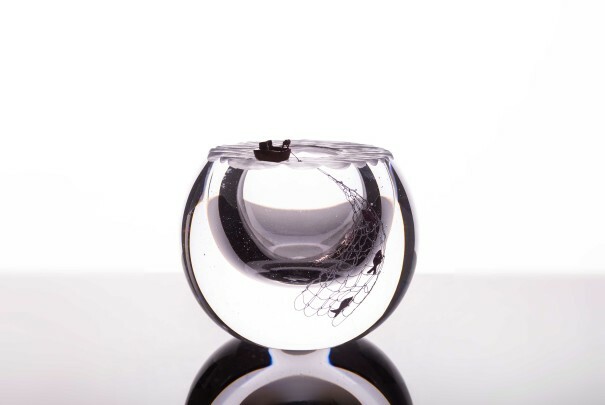 Watch Charlie MacPherson live in the London Glassblowing hot shop, Saturday the 12th of May, for an extremely special demonstration as past of London Craft Week. Years ago I was asked to respond to a piece from the Broadfield House Glass Museum collection. I chose an ornate cut mirror with sconces and elaborate detailing. The final exhibition piece resulted in an indented, mirrored vase with diamond cut free flowing patterns. This was the beginnings of what is now the ‘Silver Cut Range’. I first began working on this technique back in the 1990’s while working as a visiting lecturer at Sunderland Art College. Originally I worked on it as a way to make interesting and unusual stemware as a bit of fun. However I soon became aware that if scaled up in size, its potential in the development of larger work I was making at the time could be significant. These were vessels, mainly large bowls, inlaid with imagery which was trapped within the glass using engraved coloured glass shards. With this hotwork/coldwork/hotwork idea I saw the potential to create forms that better reflected the imagery I was using. Over time, the drawing on the glass became less important to me than the form itself. Layne Rowe’s current work utilises the hot cane roll-up technique, a hugely labour intensive process he has devised and developed. This consists of several canes, each one made of multiple layers of coloured glass, laid out in a carefully considered pattern to be fused together, rolled up onto hot glass and twisted in an energetic blowing process. Once cool the piece is then carved using a diamond wheel to reveal the inner layers of colour before being reheated, to be fire polished, ridding the work of any harsh lines or edges left by the cutting process. Layne is now making these intricate pieces on a more intimate scale in organic tactile forms. He has challenged himself to apply these complex hot and cold techniques to new shapes and also to consider how his creations work within the labyrinthine dynamic of a group. 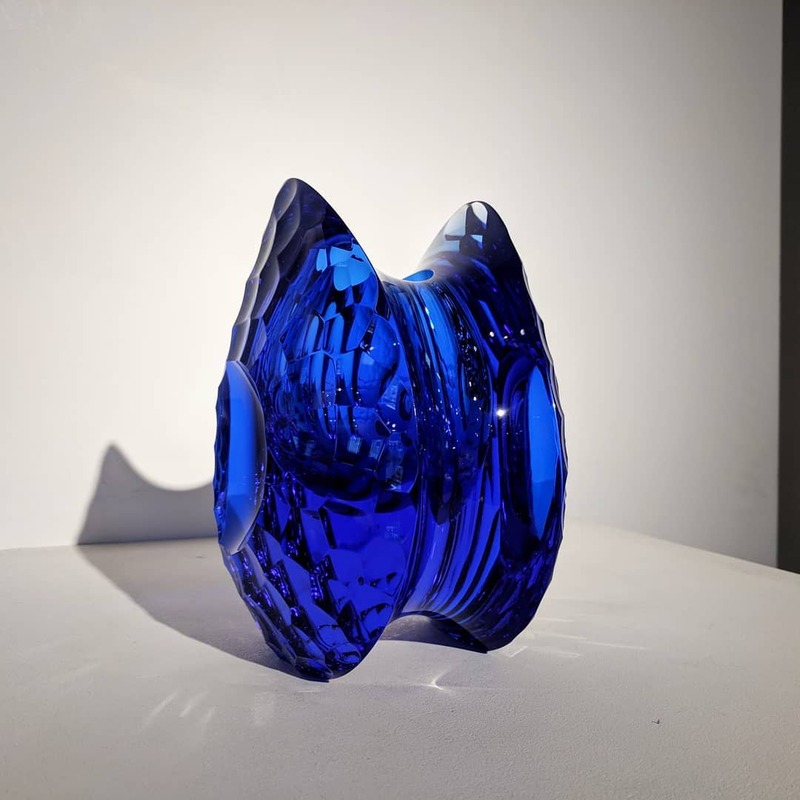 Anthony Scala’s unique technical style won him international recognition as early as 2005, when he became the youngest artist ever to win the prestigious Glass Sellers Award. He is currently revisiting and developing many of the iconic projects he has undertaken over the past two decades. Optical illusion is at the heart of his work. Perception is dependant upon light, angle and distance from an object. ‘Is what we see actually there, or is it a trick of the light?’ Take a step in any direction and the perceived image of an object can change. These shifting perceptual qualities have come to dominate Anthony’s work and are clearly an infinite source of inspiration. Anthony’s pieces utilise these quirks of perception to their maximum effect through the use of meticulously made refractive components, painstakingly pieced together. The results are beautifully constructed optical sculptures which seem to warp the laws of three dimensional space. Following a theme from a recent solo show, this piece explores the idea of domestic balance. 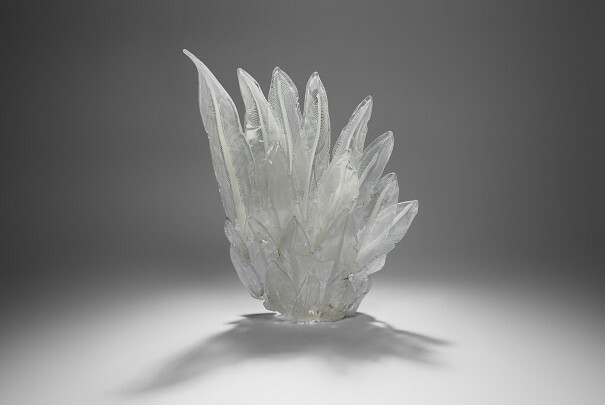 My work often contains morbid undertones contrasted with the brightness and delicacy of blown glass, and in this sculpture I have brought those ideas to the forefront. Domestic bliss is a fragile state and can be so quickly disrupted. A single violent act can crystallise in our memories to be relived again and again in our minds.